MAN UP! : Will Disney owned Marvel Comics actually make the new Spider-Man character gay? Will Disney owned Marvel Comics actually make the new Spider-Man character gay? It appears that a super hero cartoon may become the left’s new propaganda tool to try to persuade our children that not only is homosexuality OK but it has super hero status. According to several news reports, Sarah Pichelli, the creator of the new Spider-Man character named Miles Morales, says that the super hero could one day be gay. Marvel Entertainment owns the Spider-Man comic story. Disney bought Marvel in 2009 for $4.2 billion. Axel Alonso, Marvel Editor In Chief, says the new Spider-Man's race was not a publicity stunt but rather Marvel’s desire to reflect diversity according to Instinct Magazine. Click here to read report at Instinct Magazine. 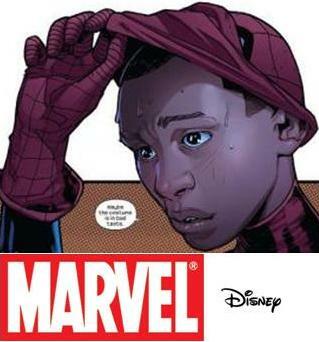 Instinct Magazine also reported: But the artist responsible for Spiderman's new image, Sarah Pichelli, says the diversity Miles reflects might go further than just race and hints that he might turn out to be gay. "Maybe sooner or later a black or gay—or both—hero will be considered something absolutely normal," said Pichelli. It is truly heartbreaking that two companies like Marvel and Disney would deliberately create a homosexual super hero for our children to embrace. These companies should show more respect to the overwhelming majority of families who want their children to continue to enjoy Marvel’s creations without being forced to deal with this social propaganda. Florida Family Association has prepared and email for you to send to encourage Marvel and Disney officials to discontinue their plans to make Spider-Man a homosexual character. Please click here to send your email to encourage Marvel and Disney officials to discontinue their plans to make Spider-Man a homosexual character. Please forward this email to friends who you know would be interested in this information. If you have difficulty loading the above link please click here or go to http://floridafamily.org/issues.php and locate this issue on the main floridafamily.org web site.